Product prices and availability are accurate as of 2019-04-15 01:01:30 UTC and are subject to change. Any price and availability information displayed on http://www.amazon.com/ at the time of purchase will apply to the purchase of this product. Upgrade Your Crafts Equipment With These Stunning Acrylic Paint Pens! Pintar Markers Come With 2 Downloadable BONUS PDF E-Books sent with your shipment E-Mail 1. Art E-Book and 1. Doodle / Coloring E-book ! Everyone who enjoys doing DIY projects should own this amazing pack of Acrylic-based paint marker combination pack by Pintar! So grab the painting marker that you need and start creating the most colorful and most detailed artwork! Get These Acrylic Marker Pens And Let Your Creativity Run Wild! By doing this, the tips of the permanent Acrylic-based marker will stay smooth for ever and the beautiful colors will last longer. visit our Pintar Art Supply website or our Facebook or Instagram page. Why Choose Pintar's Paint Marker Pens? Here at Pintar craft supplies used for craft paint have the most vibrant colors and the smoothest feel! The ink of Pintar glass paint markers is also very quick dry and water resistant, so they will remain bright and pretty for a very long time! Plus, our waterproof paint markers are 100% non-toxic, so they are absolutely safe to use. 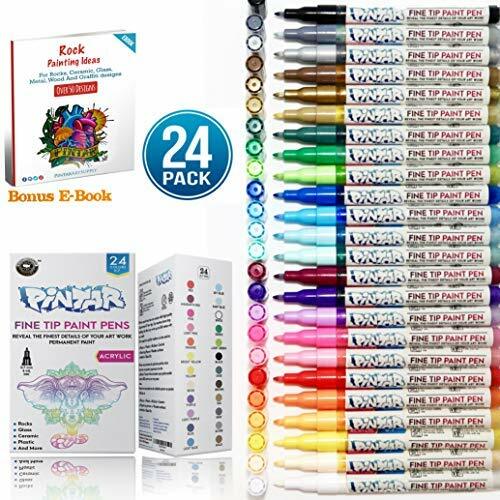 Get The 24 Water Based Marker Pen Pack Today! So don't waste another minute! You won't find an art supply for kids pack anywhere else that combines both quantity and quality! Scroll Up And Click The "Add to Cart" Button NOW! DO NOT BUY FROM 3RD PARTY SELLERS ONLY BUY IT FROM PINTAR ORIGINAL PRICE.
? 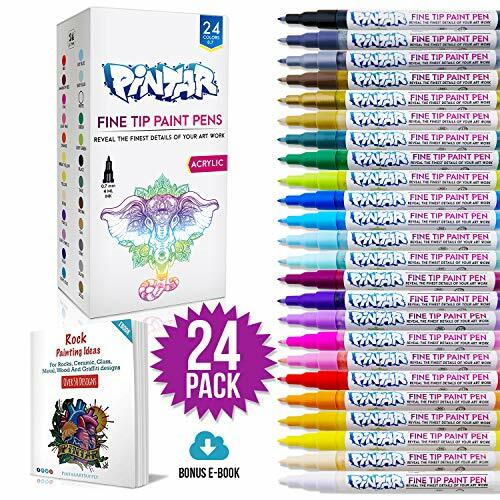 BOLD AND VIBRANT 24 COLOR PAINT PENS: The 24 Acrylic paint pens have a great variety of solid colors including, your basic collection of red, yellow, orange, green, blue, purple, black, white, and brown. In addition the pack offers various shades of the essential colors and metallic colors, such as gold and silver. Your artwork, crafts, DIY project, and graffiti will have the most beautiful colors and the most detailed designs! GREAT GIFT for every one who loves to paint and draw. ? SMOOTH FLOW OF PAINT ON ANY SURFACE: These regular and metallic paint pens can work on most surfaces - if not all - as long as they're smooth, dry and clean! 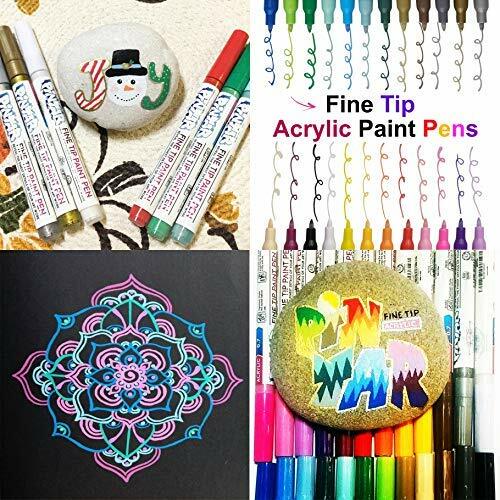 Whether you want to paint on a rock, canvas, wood, paper, metal, glass, ceramic, a plastic surface or even a tire, these awesome regular and metallic paint markers will NOT fail you. 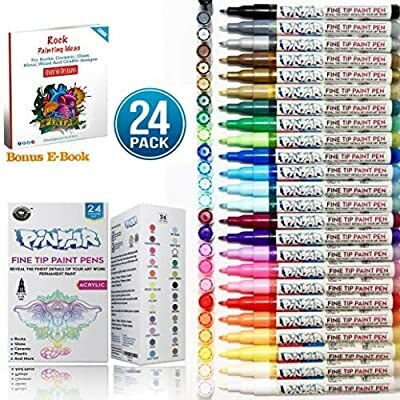 Painters choice fine tip paint pen water based markers so you can draw on the skin with no regrets.Every Art supplies must have Pintar Collection. ? 24 SET FINE LINE ACRYLIC PAINT PENS: The 0.7 mm extra-fine tip is the perfect solution to add detail to any art project! With its extra-fine tip, it has all the qualities of a paint marker in the form of a pen. If your looking for a paint marker that offers an ultra-fine, dense line to add finishing touches and details with absolute precision then your in luck! The pack includes 24 premium paint marker pens. metallic marker pens are metallic vibrant, bold colors that will not fade or smudge. ? 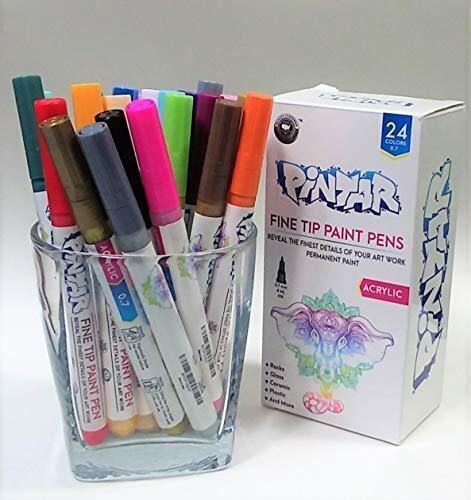 PINTAR PREMIUM QUALITY FINE TIP PAINT PENS: Made with high quality Japanese ink and tips, our glass paint pens have the smoothest flow and the most vibrant colors that can last much longer than regular permanent markers! The metal paint pens are also 100% non-toxic, so you can have some peace of mind when your little one is using them! PINTAR metallic rock paint pens are best gift for Artists. ? 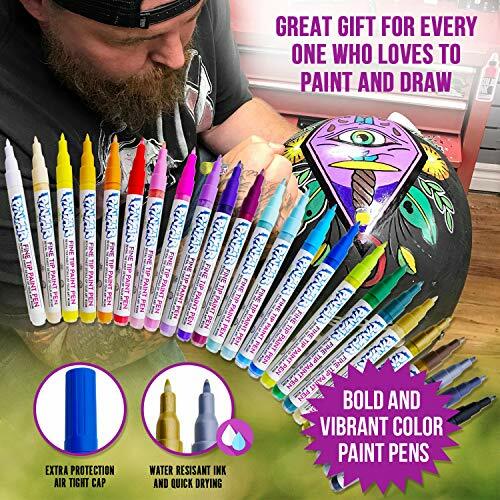 100% RISK FREE PURCHASE: 100% RISK FREE PURCHASE: Get the 24 Acrylic based paint marker pack for yourself, or as a gift for your kids or the kids of a friend or a family member! In the unlikely case that you're not satisfied with their bright colors and their water resistant ink, contact the friendly Pintar Art Supply customer support team and they'll make it right!